If comfort and easy-to-use are your main concerns as you shop for a new recliner, then look no further. This generous and plush recliner will instantly have you hooked from the first moment you sit in it. This version has comes with the ability to lay completely flat and create your new go-to nap spot. 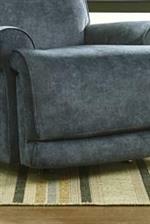 The High Power Casual Power Layflat Recliner with Pad-Over-Chaise Seating by Southern Motion at Sparks HomeStore & Home Furnishings Direct in the Thatcher, Cottonwood, Safford, Sedona, Morenci, Arizona area. Product availability may vary. Contact us for the most current availability on this product. Padding & Ergonomics Reclina-Pedic padding along with an extra 3" thick chaise pad. You deserve to have top of the line comfort to come home to after a long day, customize this recliner to create the perfect spot for you. The High Power collection is a great option if you are looking for Casual furniture in the Thatcher, Cottonwood, Safford, Sedona, Morenci, Arizona area.